The Tales series of Japanese RPGs has been around for a while, though its most recent iteration comes with about 10 major bugs. 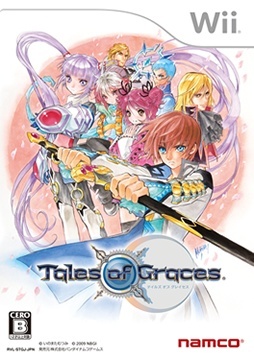 Namco Bandai has issued an official recall on its latest Nintendo Wii release, Japanese RPG Tales of Graces. The game hit shelves in Japan on December 10, 2009, with players experiencing many serious bugs since then, prompting the recall. Namco Bandai will be replacing the faulty game discs for free. Ten major bugs are listed in Namco Bandai's recall announcement, which unfortunately for this gaijin is only in Japanese. Based on a very secret translation method, the bugs involve trouble getting certain key items, enemies not appearing, item abnormalities, errors during battle, audio glitches, and game freezes. Some of these bugs may only occur after beating Tales of Graces while on a second playthrough, which could be one reason why they weren't caught. For importers of Tales of Graces that do not live in Japan, it will be very tough to get a replacement disc. Namco Bandai's recall methods require the use of a service called "Hikitoribin" (via Andriasang), where a delivery person comes to your door and exchanges the disc personally. This service is unlikely to hop across the ocean, no matter how sorry Namco Bandai is. Namco Bandai did assure gamers that it will improve its quality control in the future. Luckily for JRPG fans outside of Japan, this buggy release serves as a form of QA for the eventual European or North American releases. Thanks, Japanese gamers, though I'm sorry for your troubles. That is, as long as Tales of Graces is actually released outside of Japan. While Namco Bandai is at it, the company can release the PlayStation 3 version of Tales of Vesperia in North America too.